Northleach - The small Cotswold town of Northleach is located centrally between Cirencester and Stow on the Wold and is therefore an ideal stopping-off place from which to explore this part of the Cotswolds. There are a number of places to stay offering accommodation. 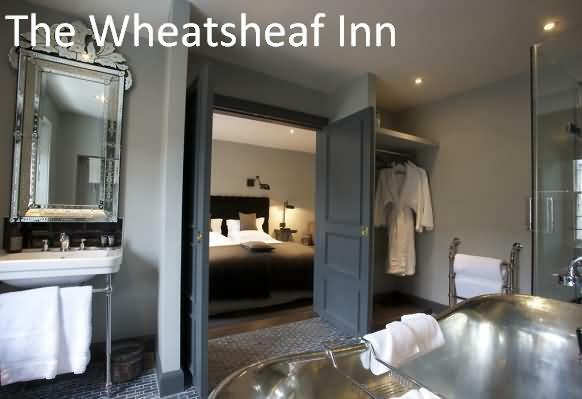 Each of the rooms at The Wheatsheaf Inn has stylish, modern décor with tasteful finishes. There is free Wi-Fi, a Bang and Olufsen TV and a private bathroom with handmade toiletries crafted in Somerset. Every morning, a continental breakfast is offered to guests. The restaurant serves creative cuisine prepared with local produce and a varied wine list. You can enjoy a drink out on the pretty terrace. The surrounding countryside is ideal for walking with small patches of forest and streams nearby. Cheltenham and Gloucester are within 30 minutes’ drive of the inn. Oxford is 28 miles away. This property also has one of the best-rated locations in Northleach! Guests are happier about it compared to other properties in the area. This property is also rated for the best value in Northleach! Guests are getting more for their money when compared to other properties in this city. 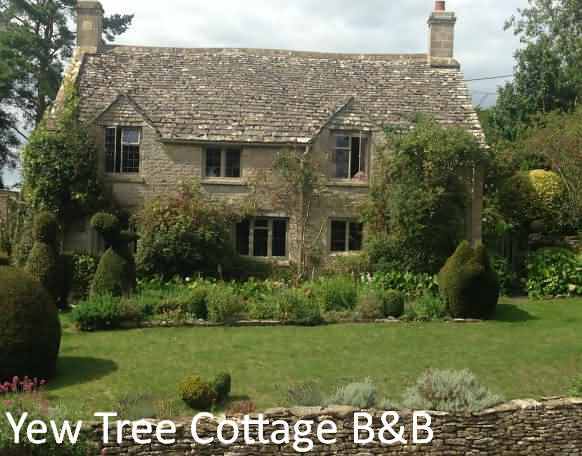 Yew Tree Cottage B&B is located in Turkdean (1.9 miles from Northleach), a rural village in the heart of the Cotswolds. The property offers free WiFi throughout, cooked breakfasts and free private parking. 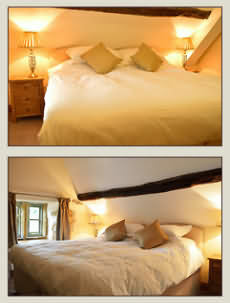 Each room at the Yew Tree Cottage B&B features a flat-screen TV a DVD player and tea/coffee making facilities. One room has an en suite bathroom, while the other has an external private bathroom, for guests’ use only. A hearty full English breakfast is served every morning, and prepared with locally-grown and organic produce. Cereal, porridge, home-made breads and jams are also available, alongside a healthy option with seasonal fruits and compotes. Supper and afternoon tea are also available. This property is set in a historic 18th century cottage, surrounded by gardens and countryside. Ideally located to explore the Cotswolds area, 12 miles from Cheltenham and Cirencester, and 15 minutes’ drive to Stow-on-the-Wold and Bibury. This property also has one of the best-rated locations in Turkdean! Guests are happier about it compared to other properties in the area. 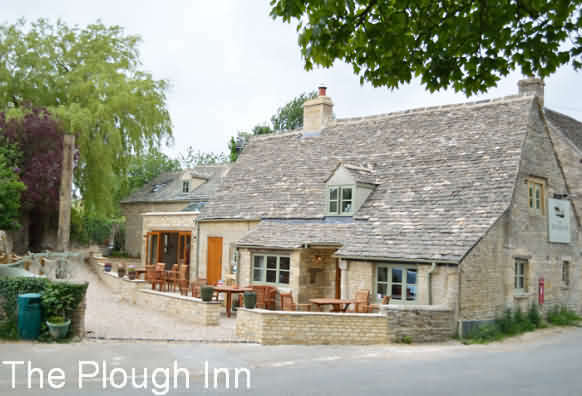 Nestled in the small Cotswold village of Cold Aston between Cheltenham and Bourton-on-the-Water is The Plough Inn, a true country pub. A firm favourite with the locals and run by locals, The Plough Inn offers a warm welcome, real ales, cracking wines and delicious home cooked freshly prepared food. With its old Cotswold flagstones, original beams and a roaring fire you can lose yourself in the history of this grade 2 listed 17th Century Inn whilst relaxing and creating a base to explore the North Cotswolds and beyond. Food is important at The Plough Inn being one of Nick and Laura's biggest passions. Between Nick and Head Chef Damion Ryan, top quality locally produced ingredients are used to create delicious freshly prepared home cooked dishes. Seasonal produce is central to our menus and we constantly change our specials board depending on what is good that day. The Plough Inn is unique in having a Bertha, an indoor charcoal oven perfect for cooking the perfect chargrilled steak or whole fish. Each room has a really comfortable bed with crisp fresh white linen, feather pillows and duvet (please ask for hypoallergenic if needed), fluffy white towels, ensuite bathroom with bath and/ or shower, luxury toiletries, hairdryer and tea and coffee making facilities. If you need anything else such as an iron please just ask. All room prices include breakfast of your choice at a time to suit you. Call or email to book, special rates for whole weekends, longer stays or just because we feel like it so always worth asking. Situated in the stunning Cotswold village of Cold Aston in an Area of Outstanding Natural Beauty, the pub is very much at the heart of the local village community. A grade 2 listed 17th Century building, The Plough Inn has plenty of history. Run today by husband and wife duo, Nick and Laura Avery bought The Plough Inn in June 2012 and spent nearly a year restoring her to her former glory, with a few alterations to the layout to create more space including three stunning B&B rooms. Opened in May 2013. Cotswolds.Info cannot currently recommend any holiday cottages in Northleach. Cotswolds.Info cannot currently recommend any camping in Northleach.